The new bridge is in! Came out great, should hold a dozer. When you see the pictures you might think "did they build a bridge over dry land"? The first few pics show you what that "dry land" looks like after a few rigs go through. We built about ten feet to the right of that path. 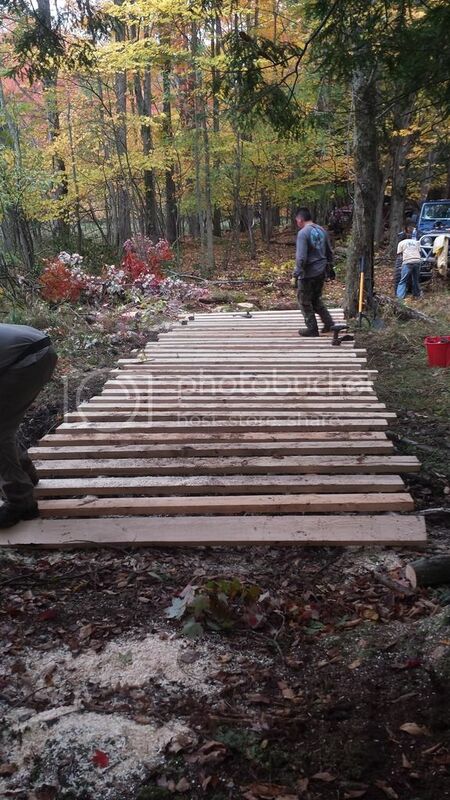 Huge thanks to Fred, Nicky, Rob, Jay, Dan, Mike, and Andy for coming out and building the bridge (me and my bum knee ran the winch and provided commentary). Attaching a video link of the maiden crossing. Scary pics, chainsaw with no safety goggles.